The business community says it is in agreement with most of the budgetary measures outlined by Prime Minister Mia Amor Mottley last night. 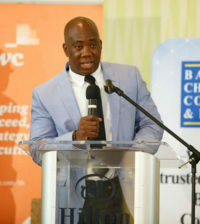 Speaking at a post budget discussion at the Lloyd Erskine Sandiford Centre this morning, President of the Barbados Chamber of Commerce and Industry Ezra Prescod said he thought Ms. Mottley’s measures were fair and aimed to encourage confidence in the economy. But Mr. Prescod also expressed concern about the increase in property taxes.